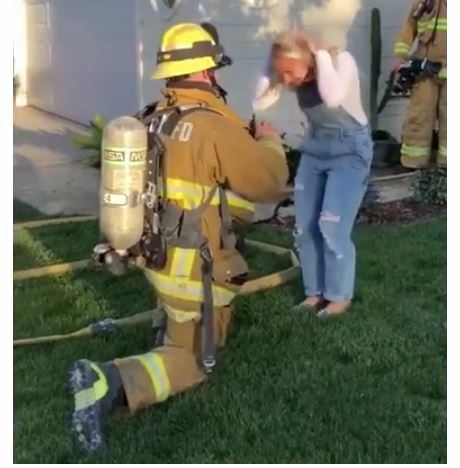 A woman in Ventura, California, had reason to be feeling a little hot under the collar when her firefighter boyfriend proposed marriage. After he faked a blaze at their house to set the scene. It happened back in November just as the couple was preparing to host a holiday party at the home they shared. For some reason, Zach Steele, 30, thought it would be funny ― unbeknownst to Maddison Ridgik, also 30 ― to plant six remote-operated smoke machines in their attic before supposedly going out to pick up last-minute groceries. He ended up going overboard with six, which caused a lot of smoke to spew out of the house, sending Ridgik into a justified panic. However, her mom was in on the prank and faked a call to 911, which gave the signal to Steele ― and a few of his firefighter buddies ― to ride to the rescue in full gear, according to SWNS.com. Ridgik wasn’t sure what to think at first. “I was so confused and I honestly could not sort through my emotions enough to really comprehend what was happening,” she told the news agency. Then Steele whipped off his oxygen mask. “I think she saw my face and calmed down, and realized what was going to happen,” he said. The pyromaniac proposal, captured on body camera footage shared by SWNS, did bring on the waterworks. The couple intends to make things official on March 30 in Ojai, according to their page on TheKnot.com.